A well-crafted sink can make all the difference when tying the kitchen together. Whether stainless-steel, cast-iron or another material, a good-looking sink is crucial to getting things looking polished. Our expert staff has reviewed some of the kitchen sinks currently available on the market. Come with us and see what specifications and details you should be looking for when you’re ready to purchase. First up on the list is Kohler’s K-6489-0. This design has a very unique look and feel, so you’ll want to make sure it fits your taste. Featuring a farm-house style apron front, this sink adds a homey and traditional vibe to any kitchen. We like this, and although it won’t fit every format, for those that want an old-school look, this might be perfect. This 9-inch deep basin is built with a two-degree slope. This helps keep water moving down the drain and prevents pooling. This is a convenient addition, as even the fastest running drain can’t always keep up. This model is also self-trimming, which is a nice feature when replacing an old sink. What this means is, that even a jagged cut along the cabinets will be masked by the built-in trim. That makes DIY home improvers breath a sigh of relief and finishes nicely regardless of experience. Though this sink is a single bowl design, Kohler does make some decent after market gear to convert things nicely into a divided two-bowl design. Heavy-duty and built from enameled cast iron, Kohler stands behind its products for preventing chips and scratches. Though our team is not always around to see installed products years later, we’ve heard good things about this model holding up to its promise. The drain is offset to allow room to work and has the feel of an art classroom style sink. Though a little too industrial looking for some, we feel this sink adds a lot to the right situation. You should pay a good attention to the type of sink you wish to install. Installation of a new sink fulfills our hope of having an attractive kitchen. You need to get the perfect sink to fit into your kitchen design and getting the best sink is the only choice you have. Kohler Whitehaven should top your list as it is very easy to install. After installation, the sink provides space for storing other kitchen utensils. We should consider selecting the best colour that fits the colour of our kitchen design. This is easy for us as this product has been produced in different colours. It also possess front apron that makes the sink fit accurately to the kitchen cabinet. 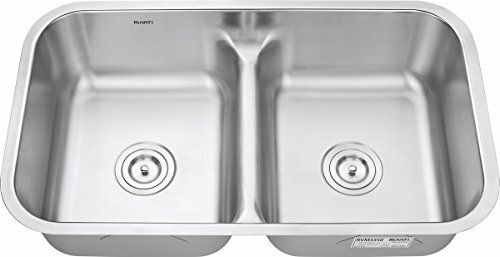 Next we reviewed the Zuhne CM-UREM-81S5 33” curved tall apron sink. While this model has many variations, this review will give you a feel for the overall specs and quality. With a single basin, restaurant grade stainless-steel design, this sink offers class and elegance. With a generous 10” basin, there’s plenty of clearance. The material is also dent resistant. This is a big deal as the years roll on with this model. We think one of the nicest features of this stainless-steel design is the noise cancellation. That annoying bang you hear when dropping pots and pans into a sink is drastically quieted. This is a small but rewarding feature that makes this stainless-steel model much more attractive. A rust-proof coating prevents the problem of appliances aging.One might think that this steel design would give your home kitchen a clinical look. Actually, we find that this model creates an inviting and polished look to a modern kitchen. Some nice internal features are the four sloped drain angles that help to keep water moving along. Rounded edges prevent sharp corners from impeding movement around the sink. For those that want a steel finished look in their kitchen, we highly recommend this one. With a full manufacturer guarantee against scratches, dings and dents you really can’t go wrong. The minimalistic and sleek look of the Zuhne CM-UREM-81S5 might just be the perfect addition to your kitchen. This is a single bowl sink made from stainless steel. It is an under-mount sink that helps to avoid spillage of water and leakage in the kitchen. It can easily drain hot water and minimizes noise during usage. It is easy to maintain, durable and fits into any kitchen design. It is 32.9” in length, 20.8” in width and 10” in depth. It weighs approximately 62 pounds. It can be installed to fit into our kitchen cabinet designs. It looks beautiful, deep and large enough to permit the washing of long trays and pans. It should be bought as soon as possible based on the recommendations of previous users. It is certain that, you will not regret buying this product. Frigidaire’s FPDP2719D10 offers another stainless-steel option with a simpler approach. With a very basic design, this Frigidaire single basin sink has no bells or whistles. What you see is what you get. That said, this company didn’t cut corners when designing this unit. Utilizing a16-gauge commercial grade 304 stainless steel, this model is no slouch. Build to last and rust resistant, this one will stand the test of time and look good doing it. Though a little plain for some people’s taste, in most kitchen environments this sink adds a touch of class.For those that fill the sink with hot water to wash, Frigidaire’s V-Therm Shield technology offers an insulation and heat retention that is impressive. Though this is not the first spec you think to analyze when sink shopping, it comes in handy. Including a sink strainer drying rack, you’ll be ready for install the first day. One complaint that we have about this particular model is the angle of the drain to the basin. They could have designed more of a slope, like some competitors, to prevent water from building up. Regardless, drainage is definitely acceptable, and we don’t find this to be a make or break detail. This is a 32” size stainless steel sink. It weighs 40 pounds. It is 31.5” in length, 18.5” in width and 10” in depth. It has drain opening of 3.5” dimension which allows easy discharge of wastewater from the sink. It has 1 basin and its mode of installation is under-mount. After purchase, a roll-up dish drying rack, strainer with basket, safe bottom grids and removable feet are accessories that should be found with the sink. This is a thick and solid sink. It is however expensive. Its values meet its worth. This is a unique sink from others as it is supplied with a roll-up dish drying rack. This rack allows the draining of dishes after washing. The Ruvati RVM4350 is an elegant two-bowl design that we highly recommend. With a lower clearance between the bowls than most other models, this sink has convenient access and usability. In fact, the clearance between the 50/50 split is 3” inches lower than the average sink. For those using their sink on a regular basis, this offers a breath of fresh air. Though it does pigeonhole the model slightly for those wanting a complete division, it offers something most sinks don’t. With a soft, brushed stainless-steel finish, this model has class. This sink can be undermount or flushmount installed, thanks to the foresight of matching the rim to the rest of body. That makes a difference in our book since it diversifies this sink’s potential applications. With 16-gauge, heavy duty stainless-steel, you won’t have to worry about dints or scratches. And because they use an ultra-quiet design, the banging of pots and pans will be minimized. Overall a really nice-looking stainless-steel sink, the price point is also very reasonable. If you like the low division split bowl approach, we recommend this model for a simple and good-looking workhorse. This is designed uniquely as a double bowl kitchen sink. This type allows us to place unwashed dishes in one bowl. The second bowl is then useful for washing the dishes. Washing can easily be done with the clearance provided by its wall. This wall separates the two bowls which is lower than other types. These qualities make it much more helpful and functional. Ruvati Rvm4350 is easily maintained based on its material and the curved corners. The material used in making this product is a stainless steel. The curved corners allow us to easily remove stains that adhere to its surface after washing. This type of sink is a model which has been made affordable. It should be purchased. The Swanstone QZ03322LS.077 is almost indestructible. For no other reason than that, we’ve included it in our reviews. Composed of 80% actual quartz stone, this sink can take a beating and still look like it just rolled of the factory floor. Don’t be deterred by the strong exterior. This sink also has class and sophistication, and when installed brings a finished elegance to dark kitchens. This model also features a convenient low divider that helps when washing dishes. Not for everyone, this feature does pigeonhole this model slightly. That said, it gets more praises than complaints. People tend to like the ability to place a larger pan down in the sink. It helps prevents splashes and lets you scrub with ease. Clean lines and simple features make this a good choice for a minimalist look. The only catch here is that the pre-drilled faucet hole is for a single faucet design. That limits things for some people. Still, if you’re looking for a heavy-duty tank that will stand the test of time this might be a good option for you. This type of sink is heavy. This is as a result of density of the material used for production. It is produced from composite granite which is graded has high quality. The composite material consist of larger percentage of quartz stone. It is a moderately sized kitchen ware. It is also easily maintained, durable and pleasing. Installation of this product needs full attention and should be done professionally. Adequate support should be provided for it. If not, the self-weight of the sink might result to early damages. However, when the sink is properly installed, it boosts the aesthetic view of our kitchen designs. It also makes the act of washing in it, pleasurable. It is affordable and should be purchased. The Kraus KBU14 is a nice rounded-edge single bowl design. With an undermount construction, this sink fits seamlessly with your cabinets. The stainless-steel on this model is robust enough to prevent major dings and scratches. We find that the padding and noise cancellation on this model is particular good and got a chance to test throwing some pots and pans in it for a trial run. In fact, 80% of the lining of this sink is covered with dampening pads. Not bad. Though the look when installed is slightly conservative, it is definitely stylish. A smooth gradual angle on the bottom of the sink allows for accessible cleaning. One of the things we liked about this model is the water-resistant finish. While some stainless-steel brands get stained with water over time, this one stands up pretty well. Nothing is uglier than water stains on a sink that won’t come off. With a rust and corrosion resistant finish, this model will keep looking good for years to come. We recommend this sink as a nice oval single basin design. Its an under mount kitchen sink made of stainless steel. It is unique from other stainless steel products. This is because it has been coated with another material. This material coated applied on stainless steel allows the free flow of water away from the sink. It is a high quality sink that prevents the observation of fingerprints during usage. The installation of this product is easy and can be carried out personally. However, it is advisable to engage professionals for its installation. It generates little or no sound. We should be careful not to wash any chemical or acid in this type sink. This is essential in order to prevent some unforeseen reactions that might lead to rusting. 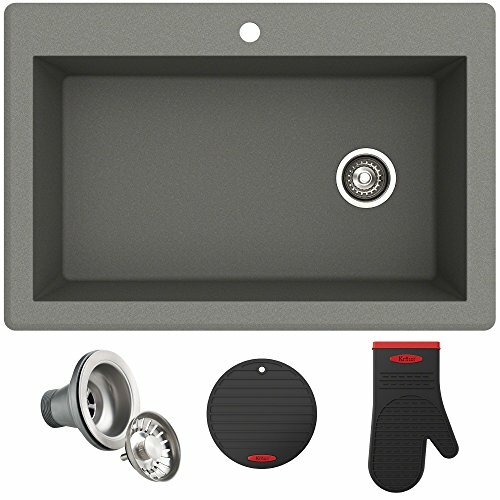 One of our top picks for a cool, modern look is the Kraus KGD-54GREY granite sink. This one has class, and with the granite composite, has a natural odor and germ resistant finish. This makes it a prime candidate for large families where there is a lot of traffic at the sink. Simply wipe this one down and grease and dirt are removed in an instant. That’s a valuable asset when trying to save time on cleaning. Silver ions are embedded in the surface coating that have a natural antibacterial property.The stone-like material of this model makes for exceptional quiet. If you drop a pot or pan in this sink, you will barely hear a reverberation. Eliminating that annoying clanging sound of a sink is a small but valuable feature. Able to withstand heat fluctuations and graded for up to 650 degrees Fahrenheit, this sink is a tank. Other models might buckle under that kind of heat. The Kraus will take it in stride and look like it just rolled off the factory line. A stain resistant coating also helps to prevent water stains. This keeps things looking elegant, even years later. Mounting hardware, Silicone Trivet, Silicone Mitt and drain Assemble should be found with the sink after purchase. It is rectangular in shape with 1 hole and 1 basin. It is manufactured from composite materials such as quartz, stone, resin and granite. These composite materials gave it the ability to eliminate noise during usage. It is a modern product in grey colour. It is designed to repel germs based on the silver ions used for production. It is easy to maintain and durable. It has been designed to resist damages from excessive heat and weight of dropped items. It has been protected from fading and repels stains. It is a brought that should be considered to fit into our kitchen design. If you’re looking for a modern, square-corner look, then the Kraus KHT302-33 is an excellent choice. Featuring a slim-line, but still angled enough to make cleaning easy, the KHT302-33 is a workhorse. This model features rear drains and a generous angle to prevent water from collecting. A nice bonus is the heavy 4mm topmount frame. It gives a classy and well-finished design. This industrial style double bowl unit has a tall divider, but still low enough to be convenient. Including customized drainage racks, the stainless-steel body can take a beating. We think one of the great features, that is not always available, is the soap dispenser option. This a great modern amenity that is sometimes overlooked by competitors. With a generous 10” of depth to this sink, larger pots can easily be fully submerged. 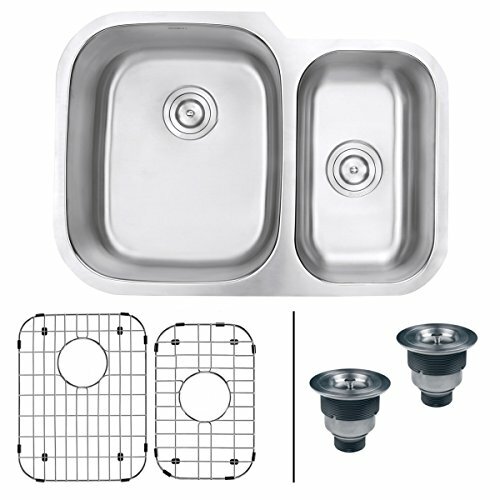 Optional steel plugs can stop the drain for larger dish washing jobs. If you’re looking for a modern stainless-steel industrial look than the Kraus KHT302-33 is a great option. This is a rectangular shaped sink made with stainless steel. It is 33” in length, 22” in width and 10” in depth. It minimizes noise during usage and drains wastewater easily due to its well-designed channel grooves and drain opening. It can fit into any kitchen design and can be installed as top mount. It prevents overflow and give space for washing long trays and pans. It is a standardized product as it meets up with the plumbing standards of Canada and United States of America. It has 2 pre-drilled holes. These holes can be used for the installation of soap disperser and faucet. The installation can be done personally. If not, it is advisable you consult professionals for installation. We wanted to include a smaller option for those in search of the kitchen sinks. This Houzer 2522-8BS3-1 is a strong candidate that takes up less room. Still providing an 8” depth, you won’t sacrifice convenience with this model. Built with 20-gauge T-304 stainless steel, this model is also built-to-last. One of the great features is the three pre-drilled holes that can accommodate various faucet options. This is not always available, and is a nice addition to this compact option. With a patented StoneGuard undercoating, this stainless-steel sink provides surprisingly quiet noise. That means less clanging when a pot is dropped on the basin. The stainless-steel might be a little too polished for some, but if that’s the look you’re going for than this model looks really nice when installed. Angled drainage to the center hole helps provide good flow and prevents backups. With a chrome and nickel coating that resists corrosion, this sink will look great for years to come. An affordable and strong solution to your kitchen makeover, we recommend the Houzer as a simple solution that will look great. Houzer 2522-8BS3-1 is a stainless steel made up of a single bowl. It is a specially made sink that ensures complete lasting beauty. 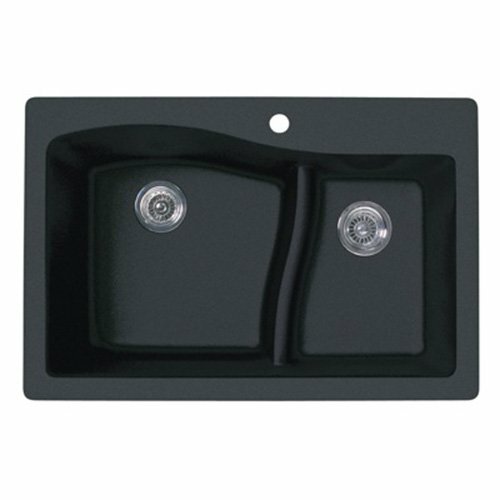 It is a top mount sink which is durable and capable of being used for several functions. It creates a pleasant environment during usage. This results from the ability of the installed rubber padding, which absorbs the noise generated by dishes during usage. It is generally supplied with instructions and fasteners. It has three and half inches drain opening. This allows free flow of water out of the sink. It is antimicrobial and fits into 30-inch base of sink. It can also be installed in laundry room for washing. The price of this product is generally affordable. For our last review we wanted to mix things up a bit. As a variation on the double bowl, the Ruvati RVM4500 offers a 60/40 setup. This gives the convenience of the spilt design but also the ability to prioritize your work area. Providing a stately look when installed, the disproportionate sizing of these formats gives kitchens a modern look. There is the slight inconvenience of having to shop for or customize a countertop that can accommodate. 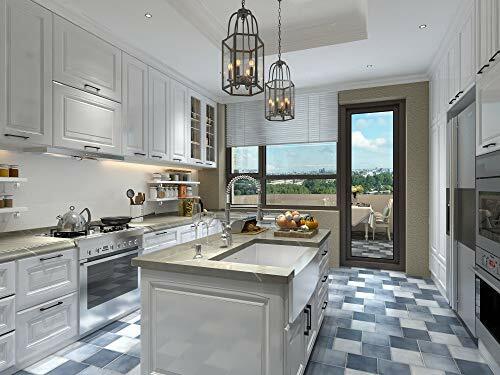 That said, if you’re up to the small challenge, you will have a uniquely upgraded kitchen that friends will envy.With 16-gauge 304 premium stainless-steel, this model is resistant to dings and dints. The brushed chromium and nickel alloy finish helps to create a polished look. Though some customers have complained that water stains are occasionally visible over time, we think this is the exception to the rule, based on our experience. With a uniform look around the rim of the sink, this one can be flushmounted or undermounted. The corners are gently curved, which give this sink a particularly easy cleaning edge. Sound guarded to prevent noise, this is a great option for those wanting an uneven split design that fits well into a modern kitchen. It is a deep bowl designed specially with rounded corners. It adds to the beauty of a well-designed kitchen. It is a double bowl product, made up of stainless steel. It is rectangular in shape and the mode of installation is under mount. 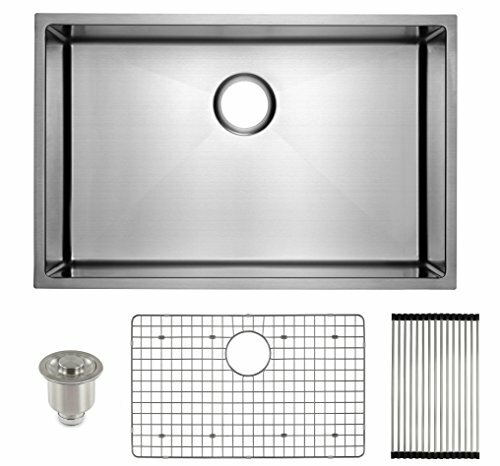 After purchase, cut-out template, rinse grids, 2 basket strainers and mounting brackets should be found with the sink. It is easy to maintain, durable and minimizes noise during usage. It has a drain size of 3 ½ inches which makes it easy to discharge wastewater from the sink. It has 29” width. It is designed has a left product and should be installed in that manner. This product meets the plumbing standard of United States of America. There are many types of sinks which include: single basin sinks, double basin sinks, round basin sinks, triple bowl sinks and farm house sinks. The triple bowl sinks are not common which does not really fits into modern day kitchen designs. The single basin sink is the most used and very common product in the market. It is mostly installed as under-mount. It is produced in various shapes and sizes. It is cheaper with respect to double basin sinks and very easy to install and maintain. However, it is makes washing of long trays, pans and dishes more stressful than the double basin sinks. It is therefore, more appropriate to install this type of sink in a small kitchen, where space is not large enough. The double basin sinks are those produced with two large bowls. This type of sink is more durable and more expensive than the single bowl basins. The two bowls makes washing pleasurable as it helps to store dirty dishes in one bowl while other functions for washing. However, the wall that separates the two bowls might pose a challenge during usage but some of the products with two bowls had been designed with low wall. This low wall ease the usage of the sink and reduces spillover of water in the kitchen. Some other type of sinks have best aesthetic quality and fits perfectly into any kitchen designs. These sinks include the round basin sinks and farmhouse sinks. The round basin sinks impresses a lot but require a round cut-out space for installation. This mostly results to waste of space and requires the consultation of professionals for installation. The farmhouse sinks on the other hand are supplied with an apron that matches the sink. They are mostly deep in size and also give space for storage of other kitchen utensils. The space available in our kitchen for the installation of sinks should be considered first before purchase. This will shape our decision on choosing the right size of sink that fits accurately to our kitchen design. When enough space is available for installation of sink, the double basin sink should be considered first before others. This recommendation is based on the benefits and functions that can be derived from this type of sink. There are various designs, colours and materials from which sinks are produced. Basically, we should consider buying sinks that are durable based on the material from which it is made from. We should also try and give recognition to our kitchen decoration and select sink material that fit best to our kitchen design. We should also consider buying a material that will not damage due to excessive heat. Generally, materials that are resistant to heat, durable and aesthetic in nature should be considered for purchase. The available materials in the market include: stainless steel, granite, composite materials, fireclay, porcelain, cast iron and copper. Stainless steel is the most common sink material available in the market. It is not only available, but also fits into almost all kitchen designs and decorations. It is generally designed with pads made of rubber that helps minimize noise during usage. However, this material fades off easily and is prone to rust due to scratches. Most manufacturers have solved this problem with the provision of bottom grids to minimize damage due to scratches. We should choose the 18 gauge stainless steel as it reduces exposure to damages. Sinks made from granites are becoming more demanded recently based on its durability. It is easily maintained and shows no stains from fingerprints after usage. However some other sinks are made from composite materials with granite. These materials are much lighter than granite and makes sink more durable than those made from only granites. These sinks are produced in different designs and colours. These sinks should be installed by professionals. Other materials like copper possess essential qualities that makes sinks extra durable. It also possess antimicrobial characteristics that is useful to promote good hygiene. In addition, fireclay, cast iron and porcelain sinks are also durable materials that should considered for purchase. However, we should make sure that chemicals are used on this materials as it affects and reduces its intrinsic values. In summary, single basin sinks are applicable for kitchens that possess little space. Little space is relative and should be deduced from our personal judgment. Such sinks are easy to maintain and are relatively durable. However, it is not easy to wash large kitchen utensils in such type of sink and sometimes makes washing somehow tedious. Double basin sink are relatively larger than single basin sinks and makes washing to be comfortable. Challenges arises due to water spillage when the walls between the two bowls are not lowered during design. Round basins are not common in the market but pleases views after installation. It should be installed by professionals as it entails making the kitchen suitable for its installation. Basically, we should consider buying sinks that are durable based on the material from which it is made from. Sinks made from granites are becoming more demanded recently based on its durability. It is easily maintained and shows no stains from fingerprints after usage. Other materials like copper possess essential qualities that makes sinks extra durable. Reading this guide should have hint us about certain tips. We should not just have the mindset of buying alone, but buying the best sink. We’ve reviewed some of the top picks for the kitchen sinks. These are among the best options available and provide a diverse set of features. Though these are both single bowl designs, they are among the most robust and elegant options. Keep in mind the specifications that are important when shopping for a sink. You’ll encounter a lot of ad copy that isn’t really telling you anything. Look for the gauge of steel used or the alloy of coating materials. These are what really gives the sink the look and feel you’re going for. Also pay attention the price and the name brands. 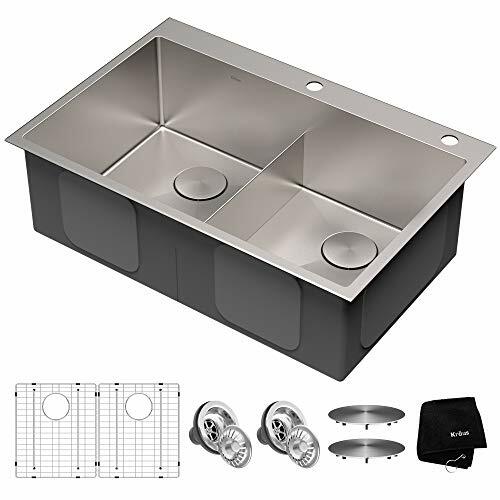 Sometimes you’re paying premiums for the brand while the features might be identical to a less expensive competitor.The sound reinforcement of the underside of the sink is also very important. That thud you hear when throwing a pot in, can be annoying. Pay attention to the amount of surface area that is actually insulated. This will help eliminate extra noise and keep things quiet and more enjoyable. You’ll also want to keep in mind the kind of counter top you will be using. This will help you determine what shape sink design you will purchase. Any counter top can be customized, so if you have a sink you really like in mind, things can be worked around. If you’re looking at split sink designs with the double bowl, you might want to consider one with lower dividers. This helps when placing larger dishes in the sink. The depth of the sink is also important. If you’re accustomed to washing larger utensils and pots, a greater depth can really help. Good luck, and we hope you enjoy the hunt for this great addition to your beautiful new kitchen. We top choices are the Kohler K-6489-0 and the Zuhne CM-UREM-81S5. 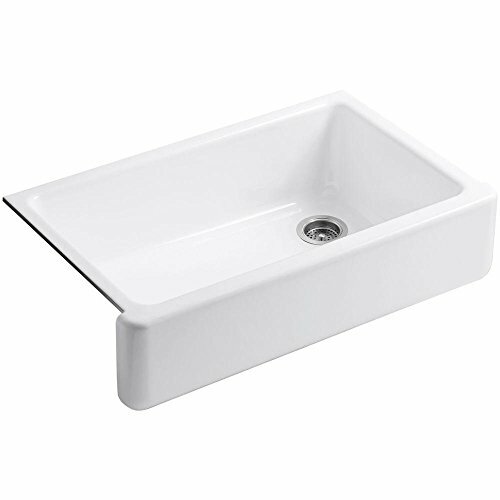 Can the smaller side of RVM4310 be reversed to the left side of the sink? This particular type of sink has reversed model, therefore the reversed designed for left side should be purchased. Can Frigidaire FPDP2719D10 be installed as a drop in sink? Yes, it can and we should make sure it is installed under-mount. Is Frigidaire a glossy stainless steel? This particular sink in question is not made from glossy material. It is finished using satin and it is not glossy. Is there a unique to wash the sink after usage? The sink should be washed with dish soap and rinsed with warm water. Does KOHLER K-6489 provide space for storing other kitchen utensils? Yes, after installation, this particular sink provides space for storing other kitchen utensils. Will I be able to get different colours for KOHLER K-6489? Yes, this product is available in different colours. 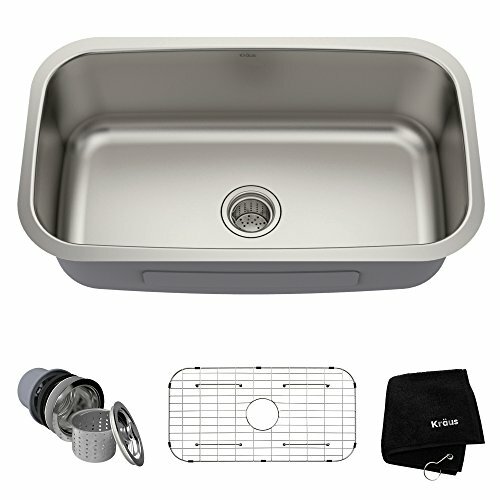 Is KOHLER K-6489 supplied along with Apron and drain materials? It is definitely supplied along with Apron but not with drain materials. Can ZUHNE CM-UREM sink drain both cold and hot water easily? Yes, it has been designed to do that easily. Thanks, what is the overall weight of the product? It is 32.9” in length, 20.8” in width and 10” in depth. It weighs approximately 62 pounds. What is the size of FRIGIDAIRE FPDP2719D10? 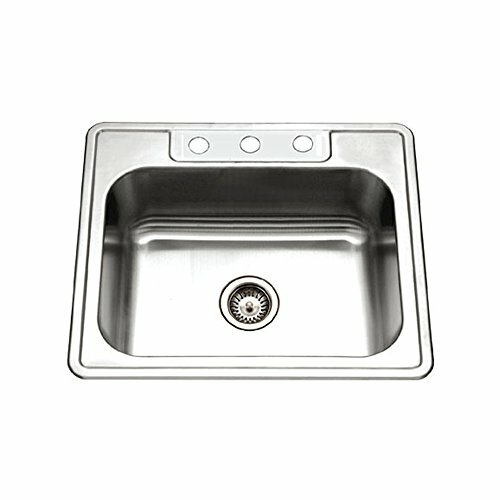 The size of the sink is 32” which is made from stainless steel. It weighs 40 pounds. It is 31.5” in length, 18.5” in width and 10” in depth. Which material is best for an average income customer like me? Sink made from stainless steel should be your target. Which of these is the best among the brand of kitchen sink? All of these products are good depending on your taste and judgment. However, FRIGIDAIRE FPDP2719D10 is the best of them all. Which of these two sink gauges is the best between 16 and 18? 16 gauge stainless steel is more durable than 18 gauge stainless. This should be considered during purchase. Should I go for a 10” deep sink or 8” deep sink, please advise me? It depends on the size of your kitchen. If your kitchen has enough space, then it is advisable to buy the 10” deep sink. Otherwise, please purchase the 8” deep sink, this size of sink will give more space for storing other utensils. What is the standard space for setting up a kitchen cabinet? And what size of sink should I install? Sincerely, large kitchens should accommodate a large sink. Note that, the space of your kitchen is a factor to consider while choosing the size of sink to purchase. What qualities should a sink have, that will make it look nice in my kitchen? I will personally recommend an undermount, stainless steel sink or a sink made with granite. These materials are the best as they make a modern kitchen design attractive. Are all double sinks larger than single sinks? Definitely, you should have a particular sink in mind for purchase after going through the reviews and questions. Despite the various attractive sizes, colours and materials, it is important that you make the best decision and put your money on the best sink. You need to note that a kitchen sink is an essential part of your well decorated kitchen. When it comes to durability and quality, most customers prefer sinks made from Kraus stainless steels to others. Within the various models of this same manufacturer, single bowl stainless steel emerges the best in sales. This is because this particular type of sink has been qualified to be made of outstanding quality. Regardless of other people’s opinion, all of these listed sinks were rated best 10 based on the overall feedbacks of customers. These sinks are generally affordable, well-designed, attractive, efficient and durable. The choice of general users have resulted to these list. It is good that you choose that best sink, that you and family feel suits your lifestyle, location, taste and income. We hope to give you more updates about the best sinks that deserve installation in your lovely household. We have gone beyond and above to serve you in recommending the 10 best kitchen sinks that are available in the market. We have taken so many efforts and resources to deliver this and we hope that you make the right decision. PLEASE, do not just buy any sink but buy the best that suits your lifestyle, taste, income, available space in the kitchen and off course that fits perfectly in your kitchen designs and decorations. 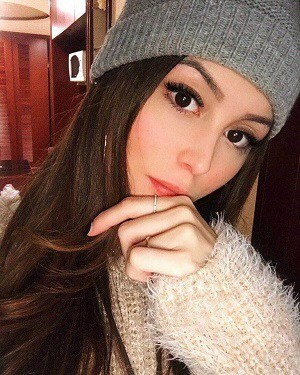 Otherwise, you might end up spending more through repairs and getting low or no satisfaction from buying the wrong type, size and material of kitchen sink. We wish you a lovely purchase. Shopping for the best kitchen sinks is fun and exciting. If you take your time and do the research, you’ll prevent a lot of potential headaches. That said, if you like a particular model and think it will go well in your kitchen, trust your gut. If you’re unsure if a particular sink will work with your space, any stainless-steel option will almost always tie things together well. Todayscave is a participant in the Amazon Services LLC Associates Program, an affiliate advertising program designed to provide a means for us to earn fees by linking to Amazon.com and affiliated sites.